Case Study: Gracious Living | Berg Chilling Systems Inc.
A large-scale manufacturer of high quality lifestyle products – Gracious Living of Vaughan, Ontario – had a large-scale problem. The soaring energy costs of their production processes were consuming an ever-greater portion of their revenue, and costs to run their process cooling equipment were a big contributor. 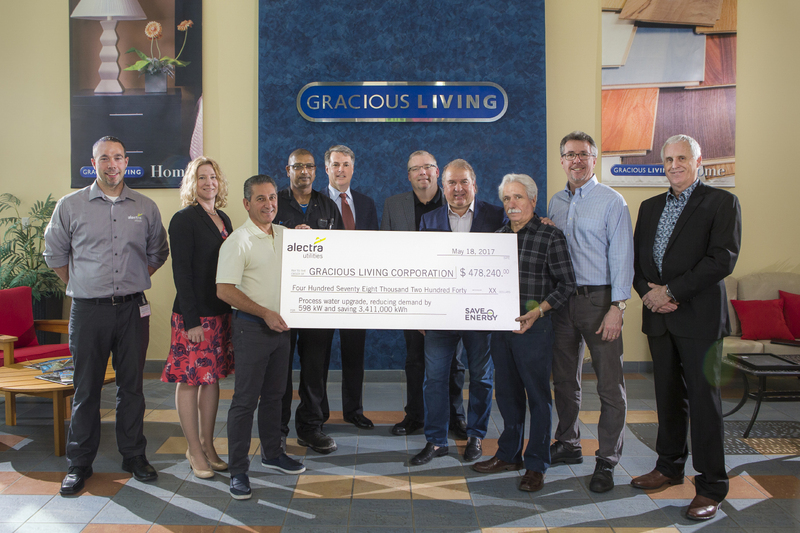 Gracious Living tackled those costs in collaboration with process cooling and energy management expert Berg Chilling Systems, and together they launched a cooling project that would cut energy costs by over $400,000 every year, and net a Save on Energy incentive of $478,000. Gracious Living began as a plastic extrusions supplier producing working stock for several fabrication companies. 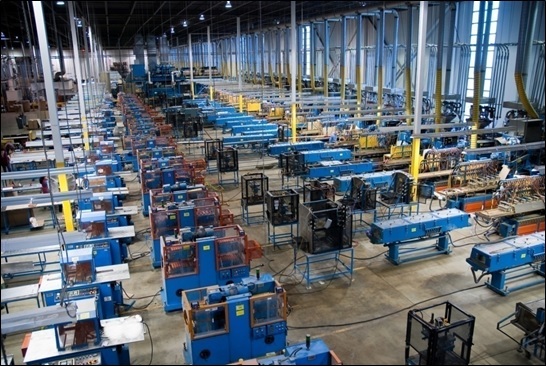 When the company expanded its capabilities to include injection moulding of finished products such as durable outdoor furniture, the extrusion division was relocated to a sister plant in Mississauga. Their 20+ year old process cooling equipment, however, remained with the Vaughan plant. Though the finished goods were successful in the marketplace, the process cooling equipment was a huge drain on both electrical and water utilities. The plant’s energy bills told the story and company management decided to act. They consulted with their power distribution company representative and surveyed companies specializing in process cooling, looking for the right company to evaluate their specific cooling needs and custom-engineer a solution without upsetting production. They chose Berg. Berg had successfully completed energy projects with several of Gracious Living’s affiliated plants and had worked closely with the local power distribution companies as part of the Ontario Save on Energy program. Mike Sinclair, Applications and Sales at Berg, relates, “Gracious Living heard good things about Berg from people in their associate manufacturing companies”. He was contacted for an initial meeting with plant managers in October 2015, and in May 2016 Berg was awarded the project. The work would be completed in two phases: the first phase would focus on reducing the bulk of the energy costs and improve cooling throughout the plant; and the second would focus on upgrading the mechanical cooling and re-pipe the chilled water system to provide better flow and consistent cold temperatures to the molds that required cold water. With the help of the Save on Energy program, Gracious Living chose a custom engineered Berg solution that maximized energy savings. The program offsets up to 50% of a manufacturer’s cost for energy conservation projects. It considers overall upgrade cost and how many kilowatt-hours (kWh) of electricity are saved. Program grants reimburse in several ways. Most commonly, payback time is significantly shortened with an incentive of $0.10 per kWh of energy savings over the first year, up to 50% of the project value. examination of the plant’s operation, production equipment, operating temperatures, and piping, the group found the root cause of energy waste – out of view in the Mechanical Room. Cooling the injection molds, a major energy cost, was being done using 50 horsepower (HP) compressors on five 200 HP water cooled chillers. During peak production periods in summer, up to eighteen 50 HP compressors, four cooling towers, and five 10 HP chilled and tower water pumps were needed. Gracious Living runs engineered plastics in nearly all their injection molding machines. Molds for these types of plastics run hot, and stand-alone temperature controllers were used to heat the mold’s cooling water from 40-80°C. The supply for the cooling water came from the chillers set for 15°C. As the molds ran, heat built up and chilled water was added automatically to control mold temperature to its set point. Hot water was sent back to the chilled water return lines to be cooled by the chillers. Gracious Living was paying huge electrical costs to heat 15°C water to 40-80°C, and then paying even more to cool it back down to 15°C. Clearly, the original setup for cooling extrusion was not right for injection molding. 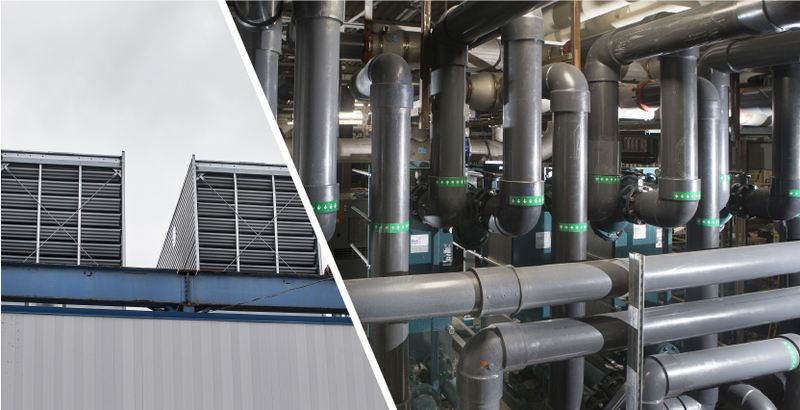 An important part of the solution was the use of evaporative cooling towers to replace energy-intensive mechanical refrigeration. Gracious Living’s towers produce cooling water between 18-30°C, so using this cooling method made sense. Less electricity is needed to heat the warmer cooling tower water to 40-80°C, and low-energy evaporative cooling from low-horsepower fans provides the same cooling for the molds. Tower water would remain well below the temperature controller set points, and at worst case would require the energy of three 25 HP fan motors versus up to eighteen 50 HP compressors. However, evaporative cooling introduced a complication. Water in cooling towers becomes dirty with particles from the air. By separating the open-air cooling water and cooling a closed process water system with a bank of heat exchangers, Berg engineers kept dirty water outside the process loop. Molds requiring 15°C water stay on chilled water. The total chilling needs for these molds involves only 3-4 compressors versus the 13-18 compressors needed before. During their investigation, Berg engineers and Gracious Living managers discovered that the cooling water pumps operated at unnecessarily high pressures and flow rates. As well, some process piping was plugged with scale, contributing to inefficiency. The piping redesign provided the required flow and pressure at a fraction of the previously needed HP. The plant, no longer burdened with the cost of energy needed to drive thirteen to eighteen 50 HP compressors, was now doing the same job with only three to four compressors and three or fewer 25 HP cooling tower fans. That is the difference between mechanical refrigeration and evaporative cooling. Redesigning the cooling water systems, ensuring equal water flow and pressure throughout the plant. Designing new cooling equipment to fit limited plant floor space. Planning and coordinating a challenging installation schedule without affecting production. Working with PowerStream (now Alectra) to develop studies and documentation required for the Save on Energy application. electrical energy costs post-completion. Alectra confirmed both values. Custom cooling equipment design and engineering. Cooling system re-piping and staged installation of new Berg cooling equipment. Complete system start-up and commissioning. Prepared plans for a chilled water system retrofit and re-piping, also without production shut down. Berg’s engineers, fabricators, refrigeration technicians, and service and installation department worked closely with Gracious Living personnel. Every decision was shared. Both groups approved each stage of the implementation. Commissioning the new systems uncovered a few hitches, including sources of un-metered water losses which were closed off, however ultimately Gracious Living has Phase One completed and is enjoying over $400,000 per year in energy savings as confirmed by Alectra. In addition, they received an incentive of $478,420 after Ontario Hydro certified the system – overall, both exceeded Gracious Living’s expectations. Plans are in place to begin the second phase of the project, upgrading the chilled water system. For 45 years, Berg Chilling Systems has served the cooling needs of diverse industries such as manufacturing, food & beverage, oil & gas, recreational ice, and transportation. Berg’s collaborative approach brings Berg professionals and client professionals together to produce custom engineered solutions specific for each application. The company’s field and in-house engineers apply unmatched expertise to fully understand and satisfy customers’ cooling challenges. 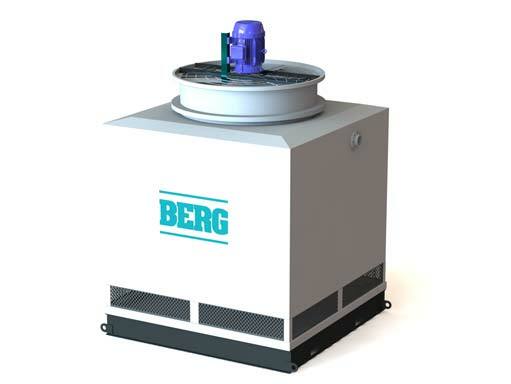 Berg’s custom-designed cooling solutions yield maximum efficiency and cost savings immediately and over the long term. Clients trust Berg expertise to make the difference between adequate and excellent.